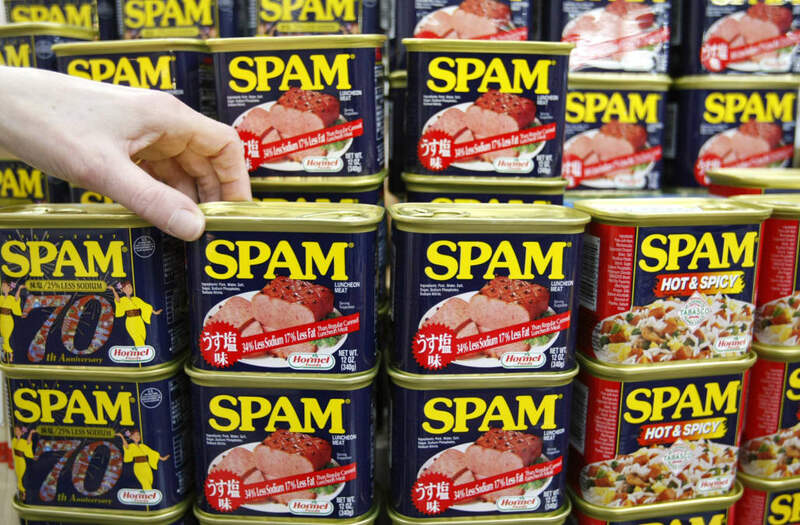 Nearly 230,000 pounds of Spam have been recalled. The U.S. Department of Agriculture said in a press release some Hormel canned pork and chicken products could be "contaminated with foreign matter, specifically pieces of metal." The USDA says there are reports of minor oral injuries linked to the recall. The affected products are Hormel cans labeled "Spam Classic" and "Hormel Foods Black-Label Luncheon Loaf" with a "best by" date of February 2021 and the establishment number "EST. 199N." The products were shipped throughout the U.S. and Guam. The department urges consumers to throw out any recalled products or return them to the store. Hormel said the recall affects a limited number of Spam products and apologized in a statement, saying the company takes "consumer and food safety very seriously." A full carton of eggs has a little more leeway than their boxed substitutes, but both should be consumed in a timely manner. If you’re debating whether to finish off that two-week old carton of whites—don’t. “It’s very safe to keep eggs in the refrigerator for three to five weeks if they’re raw and in the shell. For egg substitute products, you have about three to five days on average once they’re open. If they’re unopened you have about 10 days,” says Jessica Crandall, a Denver-based registered dietitian, certified diabetes educator, and national spokesperson for the Academy of Nutrition and Dietetics. It may seem like spreads and sauces last forever, but just because they’re in a glass jar tucked away in the cool refrigerator doesn’t mean they’re untouchable by bacteria. “Once you’ve opened the lid, that safety seal is broken, and you should be using that condiment in a timely fashion,” says Crandall. “In addition, as we make sandwiches for example, we dip our knife into the spread container and wipe it onto the sandwich and then dip it back into the container. By doing this you’re putting some of that bacteria back into the container.” Jarred condiments tend to have more exposure to bacteria and therefore could lead to foodborne illness if not trashed at the appropriate time. If you notice any water floating on top, discoloration, or weird smells—just toss it. Similar to jarred spreads like mayo and mustard, potato or egg salads are more susceptible to bacteria growth because they have more instances of exposure. Taking a few scoops at a time from the container introduces more bacteria and increases risk of contamination leading to foodborne illness. Salads like these are often pushed to the back of the fridge and forgotten about, giving time for that bacteria to grow and for that food to spoil. “Our food system is very safe, but sometimes when things fall out of temperature or if there is bacteria introduced, we have to be extra cautious with those things,” says Crandall. Check out these other summertime food safety tips you might be ignoring. Green juices may be filling up your Instagram feeds daily, but they should not find a permanent home in your refrigerator. Cold-pressed or raw juices are incredibly popular among the health-conscious because they’re nutrient-dense, but it’s important to consume them very soon after buying. Unlike typical processed juices which undergo pasteurization to kill off harmful bacteria and increase shelf life, these raw juices are not pasteurized, making them much more prone to bacteria contamination. Only buy from your local juice bar what you plan to drink in the next 48-72 hours if you want to avoid getting sick. The FDA says that ground meat should be eaten or frozen within two days of purchase. This applies to beef, pork, turkey, lamb, and any other type of ground meat. Because it’s ground, the bacteria that were originally present on the surface can be mixed throughout the meat, increasing your risk of contracting food poisoning or another illness. Don't miss these surprising foods that food experts will never eat. Fish are no less prone to bacteria than meat and should be consumed in one or two days after purchase. Otherwise, Whole Foods advises tightly wrapping it in moisture-proof freezer paper or foil and put in the freezer. Here are 11 more foods you've been storing wrong this whole time. Yes, even those packaged ones that are pre-washed. Prevention.com reports that these leafy greens still have the potential to carry bacteria like E. coli because they’re touched by so many hands. For your safety, wash all types of greens before eating and never consume them after any date posted on the bag. Why would you want a soggy salad anyway?